The Four Preps helped the country fall in love with Santa Catalina Island back in the early 60s, and this California get-away is still a favorite destination for sight-seeing, recreation, or just soaking up the rays while stretched out on the beautiful beaches. The good news for pilots is that the town of Avalon is home of the Catalina airport, with a 3,200-foot asphalt runway. Even better news for FS5.1 pilots is that Microsoft included the island and the runway in the default scenery for the Los Angeles area. This Cross Country flight takes you for a day on the beach, and since you’ll want plenty of time to enjoy that famous Southern California sunshine, I’ve planned the flight so you’ll get an early start on the day. There’s a lot more to plan with this flight than just the time of day, however. The Los Angeles basin has some of the most complex and restrictive airspace of any metropolitan area in the country, so you can’t just fire up the fan and go boring holes in the sky. And there’s another aspect of this flight that is different from most of the Cross Country flights in this book; you’ll be crossing a large expanse of open water in a single-engine plane, and this requires some special planning of its own. You’ll be departing from Runway 24 at McClellan-Palomar Airport in Carlsbad, California, about 75 nm. southeast of Los Angeles. You could simply launch and head out over the Gulf of Santa Catalina on a bee-line for the island, but this would mean flying over the water for more than 50 nm. Engine or other mechanical problems are extremely rare in the real world, but why take an avoidable chance? I’ll plan the flight to minimize your over-water flight as much as possible, even if that means flying a bit more distance than the direct routing. Note that there are hatched-lines just north of the Oceanside VOR. These lines surround two areas, marked “R-2503” and “R-2533”. The R stands for “Restricted” and these are airspaces that have been reserved for military operations. Even if you’re only puttering along at 100 to 120 knots, your closing rate with an F-18 traveling at 500 knots or faster will be about 10 nautical miles per minute—you’ll have 15 seconds to react to one just 2.5 miles away, if you even see it. So, aside from the dim view that the FAA and military take of unauthorized entry into restricted airspace, you also have some real self-interest in not straying where you shouldn’t be. The chart legend has details on the restricted airspaces (though in the real world, you should also check on the status of the airspaces when you get a weather briefing as part of your planning.) R-2503 extends from the surface to 15,000 feet—a little too high for a Cessna C-182RG to climb over in just 10 miles—but the one along the beach, R-2533, only covers from the surface to 2,000 feet. So we’ll plan to climb above that one, and stay over the shoreline to make certain that we stay clear of the other restricted airspace to the northeast. After you take off from McClellan-Palomar, you will climb to about 1,000 feet before turning right and heading for the Oceanside VOR. Watch your DME readout for the VOR, and make sure that you have reached 2,500 feet before you get to it. Your heading will be about 300º but you can also simply follow the coastline if you prefer. Notice that there is another shaded area just north of the restricted airspaces. 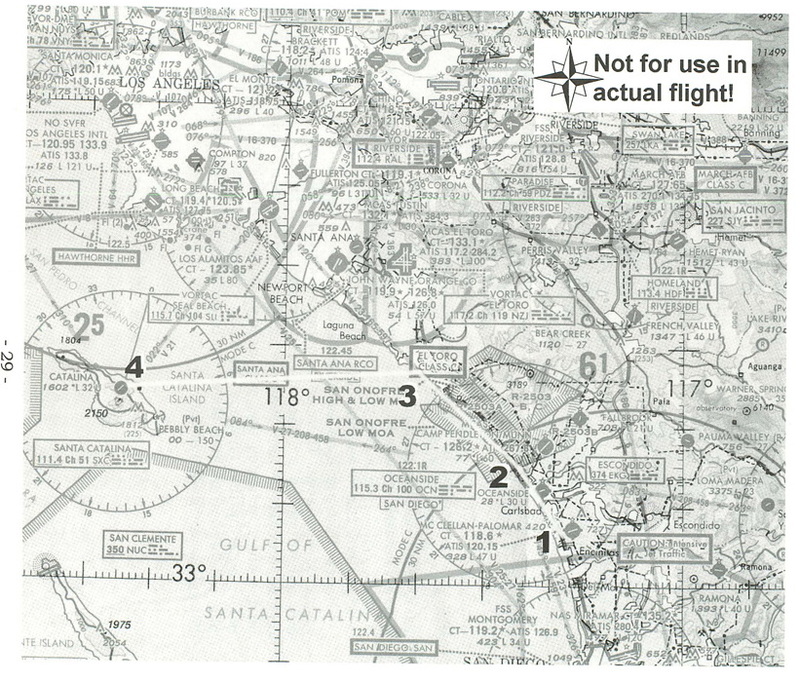 There is a notation with a “44” over a “25”, indicating that this is a special airspace from 2,200 feet to 4,400 feet on the approach to John Wayne/Orange County Airport, and a note on the chart indicates that you need to contact Air Traffic Control before entering this airspace. To make communications easier, I’ve planned for you to climb above the upper limit before you get there. I’ll explain why in a moment. (3) Plus 3 to 5 minutes to enter pattern and land. The flight log for this trip has only three checkpoints. After taking off, you proceed to the Oceanside VOR. From there, you follow the coast to Dana Point where the highway turns inland and you turn toward the water. There aren’t any good visual references on the ocean, so your third and final checkpoint will be the island itself. Earlier, we mentioned that by climbing over some of the special use airspace, you could simplify your communications requirements. The main reason for climbing, however, is because a Cessna is not a duck. Unless you have floats on your plane, it won’t land well on the water in an emergency, so you should do everything you can to make sure you have a chance to come down on terra firma. The Cessna C-182RG is no sailplane with the engine turned off, but it does glide better than a brick. Figure that you can glide at least a mile for every 1,000 feet of altitude you have. If you start your crossing before you enter the El Toro Class C airspace around John Wayne, the route will take you over about 32 nautical miles of water, shore to shore. In order to guarantee that you could glide to a shore from the midpoint, you’d need to be up at 16,000 feet. We won’t plan to climb that high on this flight; at 8,500 feet, we will be out of gliding distance for about 15 miles, or at a 130 knot airspeed, for less than seven minutes. This altitude also complies with the hemispheric rule for VFR flights where westbound flights should travel at even thousands plus 500 feet, though you won’t actually spend much time at that altitude. Note: I have planned this flight with no winds—which would be highly unlikely in the real world. A headwind or tailwind would not affect the distance you would be out of gliding range from land, but any crosswind will increase your at-risk period. If you set up your flight with a wind, consider going even higher for your crossing. To reach 8,500 feet, you’ll be climbing for the first 15 to 20 minutes of your flight. After you reach about 1,000 feet AGL (above ground level) after take off, convert to a cruise climb (aim for about 80 to 85 knots and a 500 fpm climb rate) to help keep the engine cool, and just keep climbing as you turn onto your course up the coast. When you reach 8,500 feet, level out, throttle back to 2350 to 2400 RPM and trim for level flight—you should end up at about 130 knots. But where should you make your turn to leave the mainland behind? Use a combination of good old-fashioned pilotage and radio navigation to make sure you turn before the El Toro Class C airspace. It’s a little difficult to see on the chart, but there is a highway—Interstate 5—that runs along the coast right where you’re headed. At Dana Point, the road makes a right-angle turn to the right; you go left. You should be able to see Santa Catalina Island awaitin’ for you across the sea, but follow the 247º radial of the Santa Catalina VOR as a backup. The field elevation at Catalina is 1,602 feet, and pattern altitude is at 2,600 feet. You’ll need to lose about 6,000 feet from your cruise altitude, and under normal circumstances, you’d start a 500 fpm descent when you’re 12 minutes from the field. This would mean giving up your gliding distance cushion, however, so you’re better off waiting until you’re eight miles from the island, then starting a 500 fpm descent, and make some circles to lose the remaining altitude once you get over the island. The VOR is south of the field, and you’ll use Runway 22 for your landing. There’s a right-hand traffic pattern for 22, so the easiest approach is to cross over at mid-field (traveling south to north) and make a left-hand 270º turn to enter a right-hand downwind for 22. Make sure you’re down to pattern altitude before you enter the pattern. All that’s left is to set up the instruments and some other details. First, let’s get in position. Choose OK. This should place you at the start of runway 24, ready to roll. Now set the radios. Set NAV1 to 111.4 for the Santa Catalina VOR, and set the OBS to the 247º radial. Set NAV2 to 115.3 for the Oceanside VOR; no need to set the OBS at this point, though you can set it for 310º if you want, since that will be close to your course for it after your initial climb on take off. Set COM1 to 118.6, which is the frequency for the McClellan-Palomar control tower. And set your transponder squawk code to 1200, which indicates a VFR flight. If you want to use the engine leaning feature (discussed in Appendix C), choose the Sim menu, then the Realism and Reliability item. Put a check in the box for Mixture Control to enable that feature, and then choose OK.
And finally, since we want to get a jump on the day, go to the World menu, choose Set Time and Season, and pick Dawn under the Time of Day setting. You’ll be flying over water, so you should have a life jacket in the unlikely event that you have to ditch. The time to put it on is now, before you take off, rather than wait and have to struggle into it while you are also trying to fly a plane with an engine problem. So don your Mae West along with your Ray-Bans before you fire up the engine.